Interesting one and suspect that "shedding light" is actually the issue, ironically. It's just one plant affected isn't it? 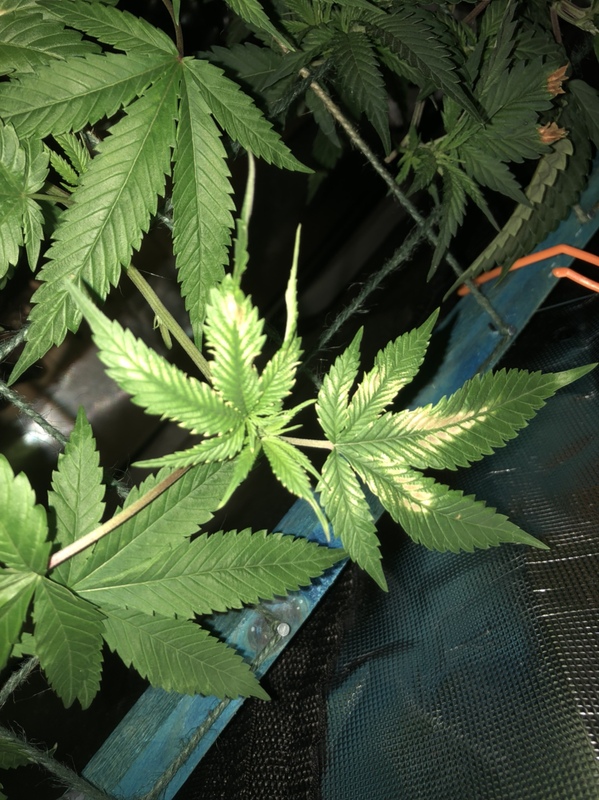 Is there a potential for a hot spot or is the light absolutely uniform across the grow? Also, are your fans oscillating? Fair play I’ll have to look that one up, yes it seems to be the one plant hence thinking it was from the led. They were touching the reflector 48 for probably a day or so. It doesn't look like too much nutes at all. 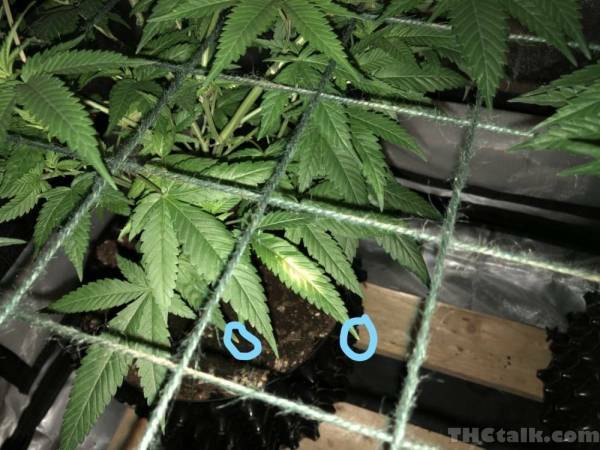 As i can see it is just partially on one plant? And not spreading over the entire plant? If you added a fan recently i would just wait out with the new setup. definitely light burn..might not be able to reverse it,,i'd prune anything burnt,yellow is what attracts bugs and you don't want that. I reckon you've mistakenly spilled water / feed on that area perhaps? 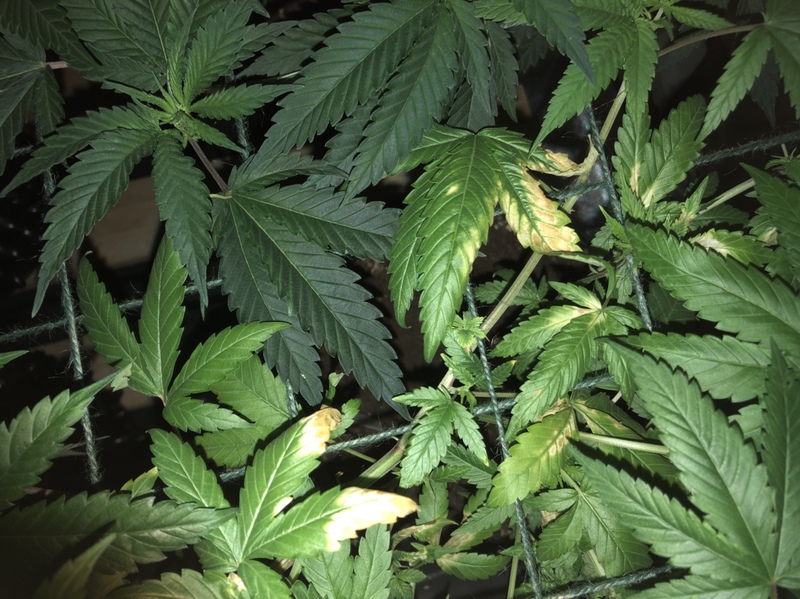 there are 4 things that look like this in canna, light burn, ph issue, too much feed, spilling on leaves. why would water on a leaf affect it?? many people do a foliage spray with no adverse side effects. Yes you are right, i myself foliar spray, however, i do this just before lights off or during lights off, but usually whilst the stomata are open whilst warm still to get most absorbed. It then has all night to dry off before lights on next. I never spray in full light. But i do water in full light and sometimes i dribble here n there lol, i then find the scorching caused by droplets on the leaves. Its a case of ruling out stuff. if the op is not dribbling (like me) then it must be either light damage or feed issues or ph. I just wasn't sure why you said "light burn or spilling on leaves"
I suppose it’s like a magnifying glass effect? I regularly dribble haha and tbh I had the intake ducting hanging past the light so that could possibly have caused a hot spot too? Hello mate. something else i've had before also.....when having lengths of ducts insulated or other wise in the groom at a horizontal level, i find that condensation from the drawn in cool air meeting warm creates pools of water in the duct that then finds its way out, usually on to plants grrrr. I have observed this 3 times now and end up running the dehumidifier due to this. In the worse affected area (where the duct joins wall coming in) i have had several botrytis outbreaks....heart wrenching stuff. I always spray durring lights on and get big droplets. I never see this type of burn. I believe the water acting as a magnifying glass to be a myth. Just my 2 cents. "They were touching the reflector 48 for probably a day or so." mind they look quite dark in pics so maybe the feeds been too strong,as well, for this particular plant at the same time.same strain doesnt always mean you get identical plants with same identical needs. doesnt look like splash to me,water tends to droplet/runoff so splash burn is normally little circles,theres some quite large patches in there that wouldnt be just splash burn. also remember led grows tend to need more calcium than bulbs grows,so something else for your list. but as with everything tinterweb,only real way of sussing it is to be there,know everything about your grow etc etc. if i get leaves that are unrepairable/murdered, i just nip them off or fold them out of sight.haha. Awesome thanks again guys. 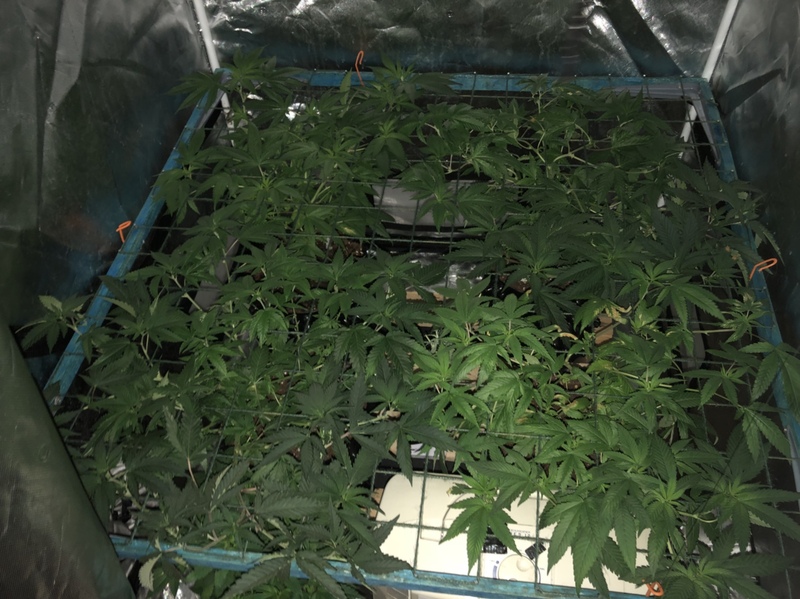 Yes they’ve been dark again so plain water, there had Minoan lowest dose nutes for maybe 2 feeds so possibly the fact I’m using canna terra soil over biobizz light as I have in the past..? They’ve had a good trim since and are starting to look like they could do with some cal mag so that’s going in tonight. Check all the tips of your leaves. This doesn't look much like Light burn to me, more like a tad over feed. It’s blowing my mind as they’ve had pretty much no feed, could it just be the soil?